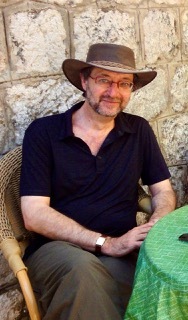 Guy Gavriel Kay CM (born November 7, 1954) is a Canadian writer of fantasy fiction. The majority of his novels take place in fictional settings that resemble real places during real historical periods, such as Constantinople during the reign of Justinian I or Spain during the time of El Cid. Kay has expressed a preference to avoid genre categorization of these works as historical fantasy.As of 2016[update], Kay has published 13 novels and a book of poetry. As of 2018[update], his fiction has been translated into more than 30 languages. Kay was born in Weyburn, Saskatchewan, and raised in Winnipeg, Manitoba, Canada. When Christopher Tolkien needed an assistant to edit his father J. R. R. Tolkien's unpublished work, he chose Kay, then a student of philosophy at the University of Manitoba. Kay moved to Oxford in 1974 to assist Tolkien in editing The Silmarillion. He returned to Canada in 1975 to take a law degree at the University of Toronto. He was called to the bar of Ontario in 1981. Kay became principal writer and an associate producer for a Canadian Broadcasting Corporation radio series, The Scales of Justice, and continued as principal writer when the series went to television. In 1984, Kay's first fantasy work, The Summer Tree, the first volume of the trilogy The Fionavar Tapestry, was published. The Fionavar Tapestry, a portal fantasy in which five travel from our Earth to "the first of all worlds". Tigana (1990), taking place in a setting based on renaissance Italy. A Song for Arbonne (1992), inspired by the Albigensian Crusade in medieval Provence. The Sarantine Mosaic, inspired by the Byzantium of Justinian I.
Ysabel (2007), a contemporary fantasy set in Provence, centering on a teenage boy and his encounters with characters from the distant past. Linked to his The Fionavar Tapestry. River of Stars (April 2, 2013), taking place in the same setting as Under Heaven, based on the 12th century Song Dynasty and the events around the Jin-Song Wars and the transition from Northern Song to Southern Song. Children of Earth and Sky (May 10, 2016), taking place in the same world as The Lions of Al-Rassan, The Sarantine Mosaic, and The Last Light of the Sun, and taking place in a world based on Italy, Istanbul and the Balkans in the 15th century. A Brightness Long Ago (May 14, 2019), set in a world based on early Renaissance Italy. Beyond This Dark House (2003), a collection. Kay won the 1985 Scales of Justice Award for best media treatment of a legal issue, Canadian Law Reform Commission, 1985, for "Second Time Around". The Wandering Fire won the 1987 Prix Aurora Award in the English category for best speculative fiction. Kay won the 1991 Aurora Award for Best Novel for Tigana. Kay was runner up for the White Pine Award in 2007 for Ysabel. Ysabel was the winner of the 2008 World Fantasy Award for Best Novel. Kay has also won the International Goliardos Award for his contributions of the international literature of the fantastic. Under Heaven won the Sunburst Award in 2011 and was long listed for the IMPAC/Dublin Literary prize. Kay was appointed to the Order of Canada in 2014 "for his contributions to the field of speculative fiction as an internationally celebrated author." Under Heaven won the 2015 Prix Elbakin in France. River of Stars won the 2017 Prix Elbakin in France. Kay has been nominated several times for the Mythopoeic Fantasy Award for Adult Literature. Kay has been nominated four times for the World Fantasy Award, and won in 2008 for "'Ysabel'". Kay has been nominated multiple times for the Canadian Sunburst Award. ^ Flood, Alison (October 29, 2014). "Guy Gavriel Kay: 'I learned a lot about false starts from JRR Tolkien'". The Guardian. Retrieved April 1, 2017. ^ "A Brightness Long Ago by Guy Gavriel Kay". PenguinRandomhouse.com. Retrieved September 5, 2018. ^ "Remise de trophées du prix Elbakin.net - Elbakin.net". www.elbakin.net (in French). Retrieved October 13, 2018. ^ "Remise des trophées du prix Elbakin.net adulte aux Utopiales 2017 - Elbakin.net". www.elbakin.net (in French). Retrieved October 13, 2018. ^ "2011 The REading list | Awards & Grants". www.ala.org. Retrieved October 13, 2018.